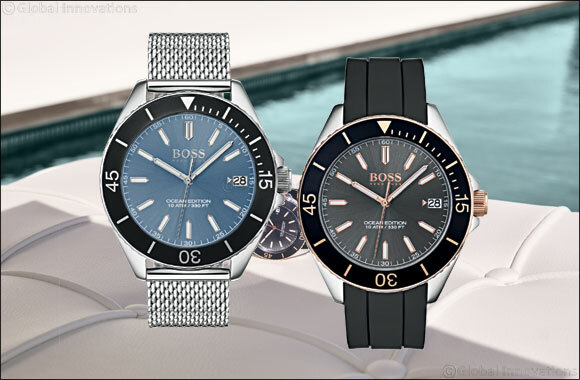 Dubai, UAE, April 11, 2018: Whether wearers of the BOSS Ocean Edition are the type to swim against the tide or go with the flow, these timepieces will keep them buoyant. Effortlessly elegant, it pays tribute to classic, luxurious sports watches. A uni-directional bezel and a bold, angular case confirm a refreshing sense of adventure that’s anchored in technical competence. The collection’s intrinsic design, integrating features such as different shades of blue on brushed dials and a contrasting choice of attachments, opens up new horizons for stylish timekeeping. Attention to detail enables the BOSS Ocean Edition to keep right on course, functionally and visually. The robust bezel is easy to read, as is the dial with its LumiNova elements that come into their own after dark. Inviting a second glance, the dial also bears the collection name, evidently proud of its nautical inspiration. Available at Hour Choice stores across the UAE, the timepiece with rubber strap is priced at AED 845 while the timepiece with metal strap is priced at AED 1,025.